1.In the tree-view click the Variables node. 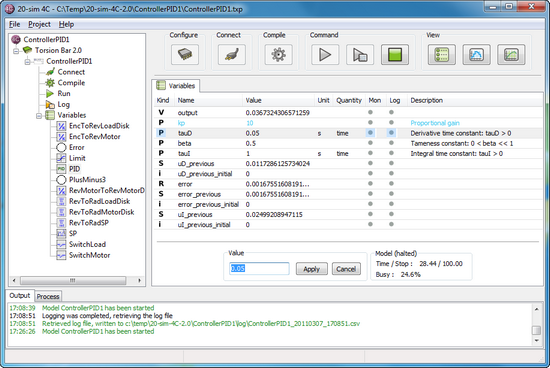 Now you will see all the variables and parameters that are available in a model. If the model contains hierarchy, you can expand it to show all the underlying submodels. 2.Click on the plus sign to show all the underlying submodels. 5.In the Value field at the bottom of the tab, change the parameter value, followed by the Enter key. The changed value will now become blue to indicate that the value has been changed locally but not yet applied on the running model. The value has not been applied instantly since you may desire to change multiple values at the same time. 6.If desired, repeat the previous steps to change other parameter values. 7.Click on the Apply button at the bottom of the tab, to apply the changes. The color of the changed parameters returns to black again when their new values are applied. You can change multiple parameters values and click Apply to instantly apply the changes.